Endless vineyards used to cover the hills of Târnave Valley and winemaking was the most profitable business for the people living in the area. Thus, the region was named Wineland in the maps of Johannes Honterus, the xylograph of Sebastian Münster and the map of Vicenzo Coronelli, in the 15th- 18th centuries. Several noble grapes varieties were cultivated, all being very much appreciated for their quality, throughout Transylvania. The widespread cultivation of grapevine influenced the civilization and culture in the Târnave Valley, as the field researches inside the 2016 project Travellers in Wineland revealed. 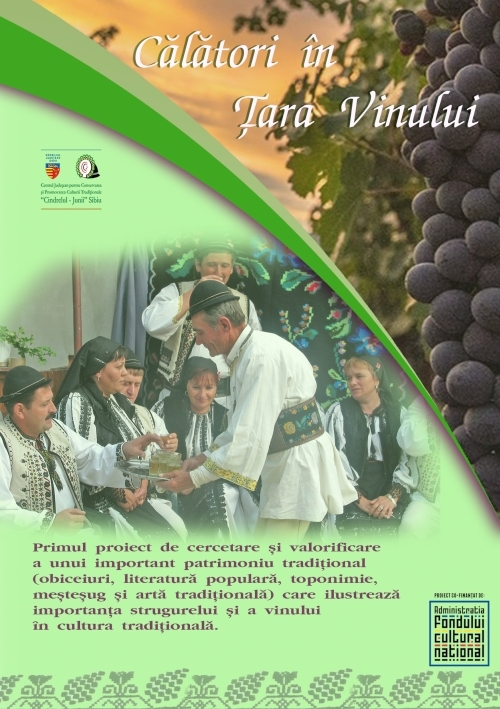 Travellers in Wineland is a project initiated by the District Centre for the Conservation and Promotion of Traditional Culture “Cindrelul- Junii” Sibiu, with the financial support of the District Council of Sibiu and the co-financing of the Administration of the National Cultural Fund. Thus the exhibition illustrates the importance of grapevines and grapes in the area, from the traditional way of growing grapes and making wine, to the usage of the two visual symbols on the houses and coats of arms, to the presence of the two icons in the traditional culture – in literary folklore, on pieces of clothing, on objects and also in religion, in both orthodox and evangelic churches. 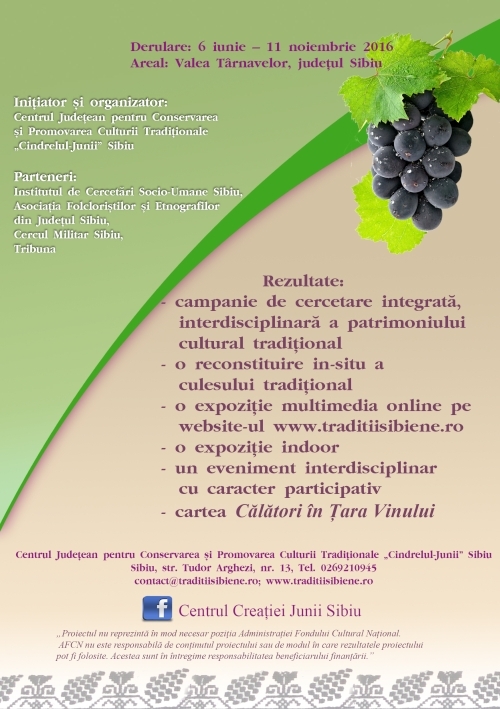 So for the first time, different elements are brought together, to stand proof for the great influence of viniculture in this ethnographic region of Sibiu County. This exhibition uses various communication media such as image, text and video. Most of the information was gathered in June-October 2016, by the research team; for further documentation the researchers also made use of documents from the archive of the institution, from 2009 – 2015.